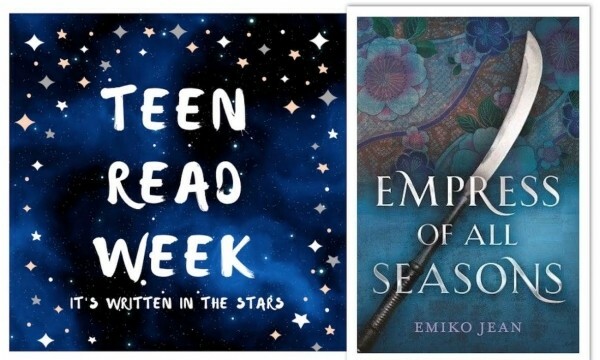 Teen Read Week 2018: Author Chat with Emiko Jean (Empress Of All Seasons), Plus Giveaway! Read on for more about Emiko, her novel, plus a giveaway! Emiko Jean is the author of the psychological suspense novel We'll Never Be Apart. Her second novel, Empress of All Seasons, is inspired by her Japanese heritage. Emiko lives in the Pacific Northwest with her husband and children. Aside from reading and writing, she loves hiking and travel. Follow her on Twitter: @emikojeanbooks. Meet Empress Of All Seasons! In the contest to become the next empress of Honoku, the winner is the one who survives. Mari has been training for her whole life, so winning should be easy—but she’s hiding a deadly secret: she is a yōkai, a supernatural race of monsters and spirits the emperor has sworn to destroy. As she fights to keep her true identity hidden, Mari’s fate entwines with that of Taro, a prince with no desire to inherit the throne, and Akira, half-yōkai and an outcast among humans and yōkai alike. Duty and love, loyalty and betrayal, vengeance and forgiveness collide and the fate of Honoku itself is at stake in this beautifully written, thrilling fantasy. YABC: What book or books were your go-to choice when you were a teen? to this day I still love a good bodice ripper. My love of sci-fi/fantasy started with more adultish books such as Dune, The Hobbit, Fahrenheit 451 etc. YABC: What current YA book would you recommend to your teenage self? Anything with an Asian lead protagonist, diversity in kidlit was few and far between when I was a teenager. I would’ve loved Jenny Han’s To All the Boys I’ve Loved Before, anything by Julie Kagawa or Renee Ahdieh. YABC: Was there a class in high school that you wished you had paid closer attention to and why? Honestly, English/Language Arts, especially the grammar/copy edit sections. I’m a terrible copy editor. I’ve been accused of some pretty serious word crimes, abusing commas for example. I would have saved myself a lot of future strife. Also, while we’re going back in time and giving my former self-advice – DO NOT get anything on your face pierced. YABC: What 3 YA books would you love to recommend to our readers? Each are a little different but the writing is superb. The cover is absolutely gorgeous and will attract your YA Readers. I find the synopsis very intriguing and I can't wait to read this novel. Love the colors on the cover! The synopsis sounds amazing! I really like the cover, and the book sounds amazing! I love Asian fantasy so much, I can't wait to read it! The cover is perfection and the synopsis sounds fantastic! The cover is very pretty and the synopsis sounds like a great read! The cover is beautiful and the synopsis sounds exciting. The cover is beautiful and the synopsis sounds interesting. Love the Japanese mythology. The cover is beautiful and I like the floral pattern. The synopsis is very exciting. I am looking forward to this one.